A perfect high current ideal diode, single rectifiers are a single, one-way electrical valve commonly deployed in multi-battery configurations where a single auxiliary battery is dedicated for applications where discharge of the auxiliary battery is to be independent of the primary battery. Don’t confuse POWER-GATE Ideal Diodes with more common, lesser performing silicon and Schottky isolators. 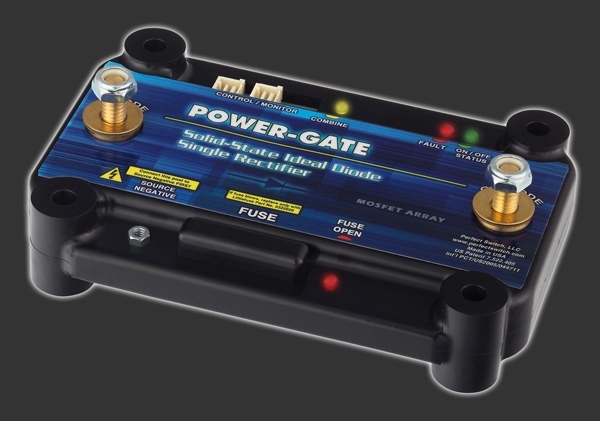 POWER-GATE sets the benchmark for ultra-low on-resistance which means devices require no heat sinking and no airflow at currents up to 300 amps. Encapsulated in a custom, injection molded ABS package, single rectifiers are perfectly suited for high vibration, dirty, and moist environments. 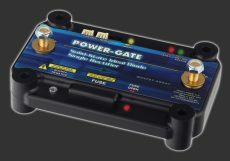 Available in our Small and Medium enclosures, POWER-GATE is recommended by top battery manufacturers to insure that DC power gets to where it’s needed without the excessive heat and voltage-loss typified by more common, lesser performing silicon and Schottky devices. Need help configuring a Single Rectifier? Click Here. For OEM applications, military and fleet sales, special applications, or general questions call us 858.720.1339.